Today I planned to go to Purl Soho and then kinda see what happened after that. 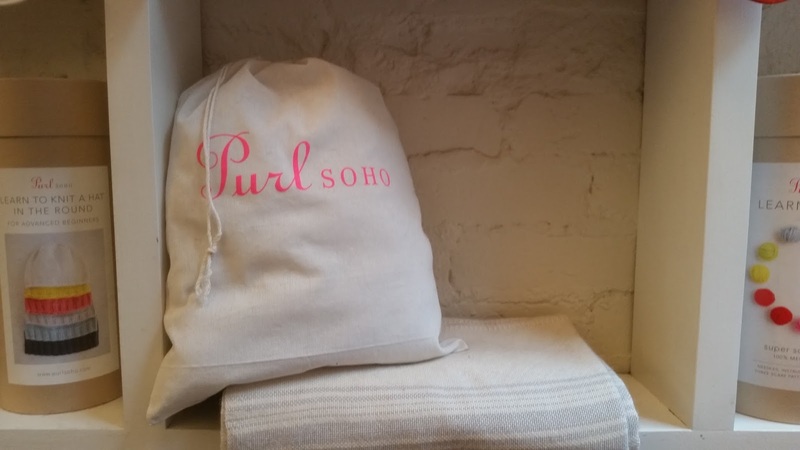 I went to Purl Soho and loved it. On the way I was doing my knitting on the Subway, and several people spoke to me. People never usually speak to you on the train, so that was very cool. After I left there, I just started walking; looking for a Starbucks so I could use the bathroom, get a drink and see what was around with their wifi. I never did find the Starbucks or a bathroom (till I got back to the apartment tonight) but I did find an adventure. I was walking along and I heard a man say, "that's the new World Trade Centre" to his friend and I looked and saw a tall building. I thought I'm so close I should really find the monument, so I started following the signs. There was a seven hour queue for the museum but you could walk right up to the monument. 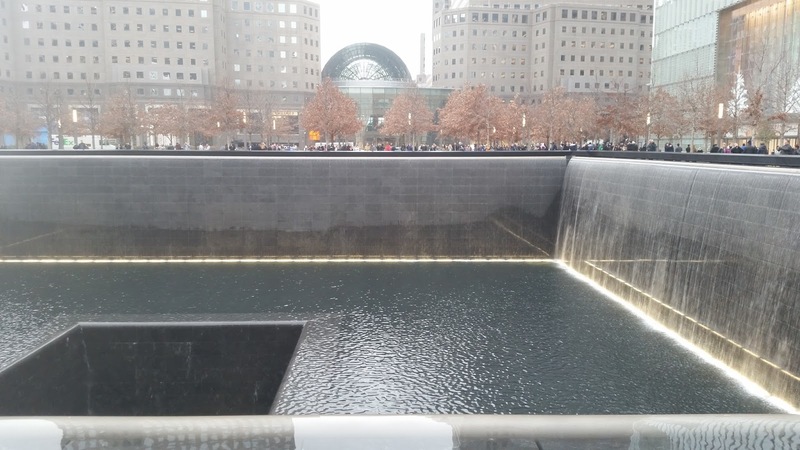 I stood at the south pool and was awestruck. 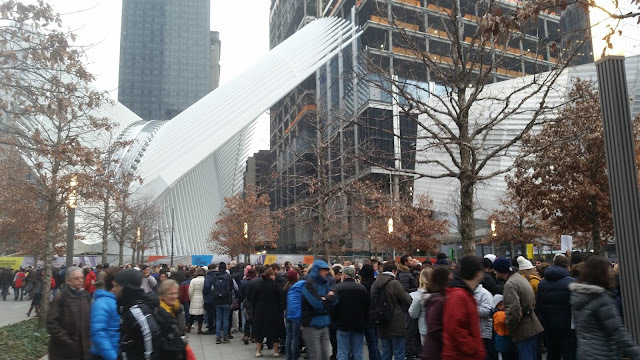 There were thousands of people milling around, but there was a sense of reverence to them all. As I walked past people, I could hear them telling the story of the day to their children. I kinda felt like I shouldn't be there, that this is a precious place for Americans. I remember how much I hated the disaster tourists flying overhead after the earthquakes, and I wondered if American's wish that foreigners would stay away from their place of pain. 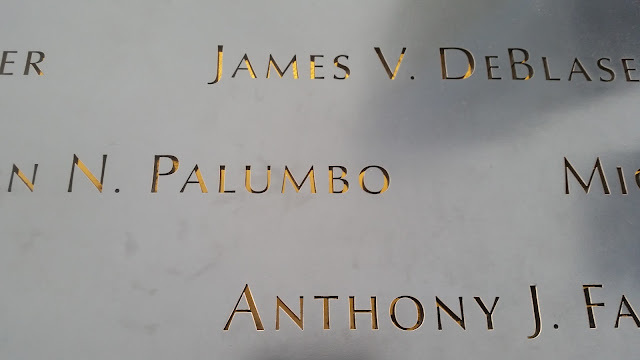 But I do remember when the twin towers fell, I remember James running through to tell me that "airplanes are falling out of the sky". I remember how we all were glued to our television screens as the horror and the enormity of what happened became apparent. I know that it is hard for us who live in other parts of the world to understand why America does some things and the way that they do them. But standing there by this visible reminder of the terrible thing that happened, I felt like I was standing by the hole in America's heart; a thing that will never heal up because it struck so close to home. It was a privilege to visit. 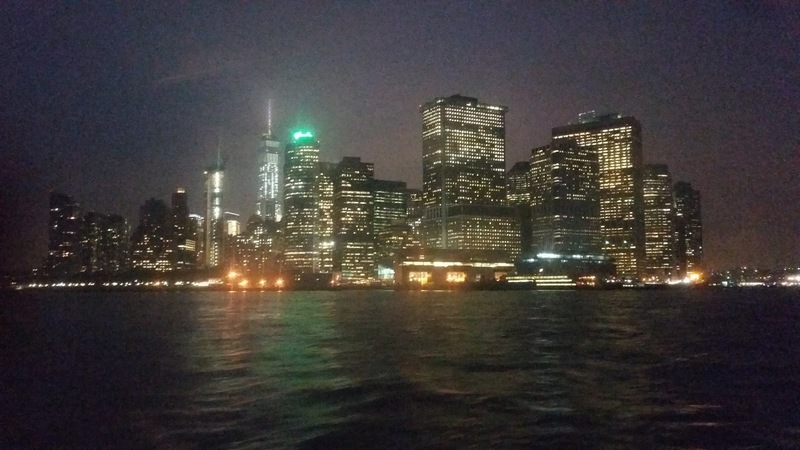 After that my legs were tired and I saw a lady selling tickets for a boat trip to see the Statue of Liberty. I thought I could do that, I could sit down. So I brought a ticket and then stood in the freezing cold in just a cardigan and dress for two hours. 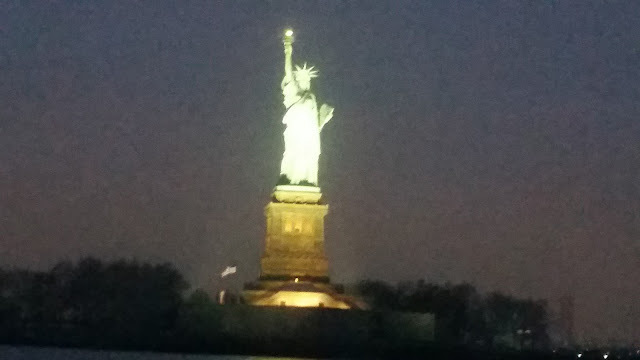 It was worth it though, I saw the Statue of Liberty with my own eyes. September 11 happened to the world. Many foreign nationals were killed that day along with US citizens. The monuments are to ALL the lost from that day-you are most welcome, the world is welcome. I've read many accounts of our memorial, but yours is, by far, the most touching. Because you have personally experienced the horror and destruction of the earthquakes, your heart is open to ours. 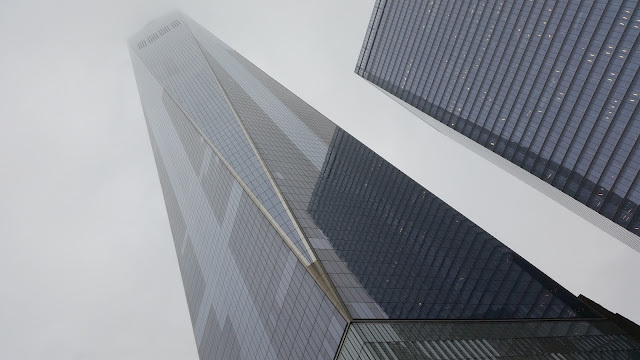 We stood atop the twin towers the weekend before they vanished. The planes flew right over my backyard. Ours was a tragedy, but the world leaned in and held us. All are welcome. I read the first comment and will go to your instagram too. Wow! What an amazing day. I love when unplanned days evolve and become really special and memorable.